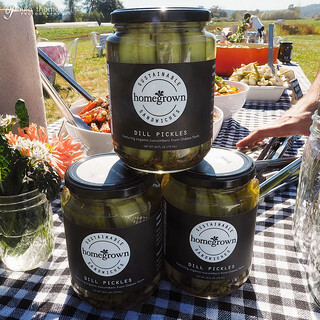 My favorite lunch spot in Redmond, Homegrown, and Oxbow Farm are collaborating to produce some awesome pickled goods, starting with organic dill pickles made by Seattle Pickle Co. We got to open some up and try them out and even took a jar home. They are crunchy and delicious, not too vinegary like a lot of pickles are. These will be available in stores next week. Something else to look forward to are some pickled bite sized beets. 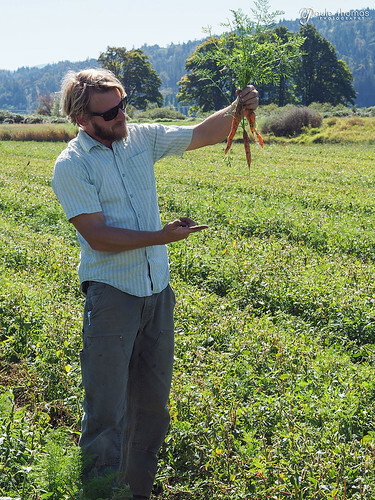 In the process of thinning their beets, Oxbow will be saving the small bite sized beet roots for pickling. I thought it sounded like a great idea and can't wait to try them. 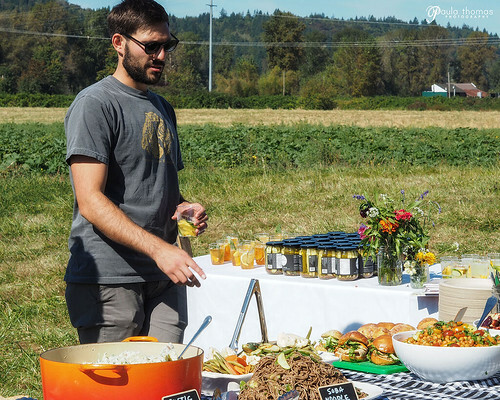 I was invited to a lunch at Oxbow Farm that had a delicious cucumber themed spread of food prepared by Homegrown, who also does catering in case you didn't know. My favorite part of the meal was the kimchi cucumbers. I've been wanting to learn how to make kimchi for quite a while now and these cucumbers reminded me that I need to get on that. 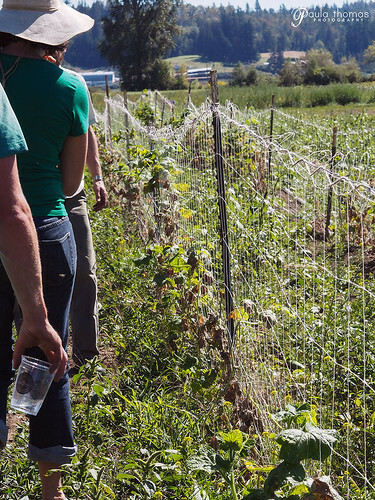 After lunch, Adam, the Farm Manager, gave us a quick tour of a few of their fields. 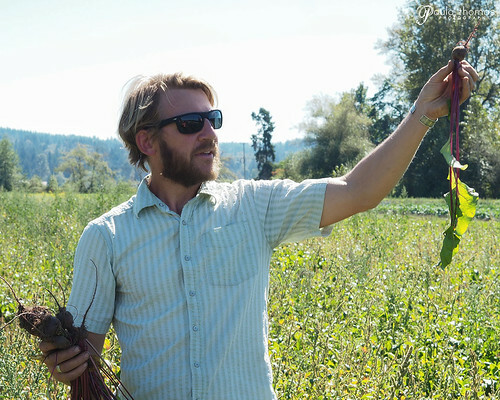 Like any farm or garden, they have weeds and their biggest weed problems appeared to be amaranth and lambs quarter, both of which are actually edible. 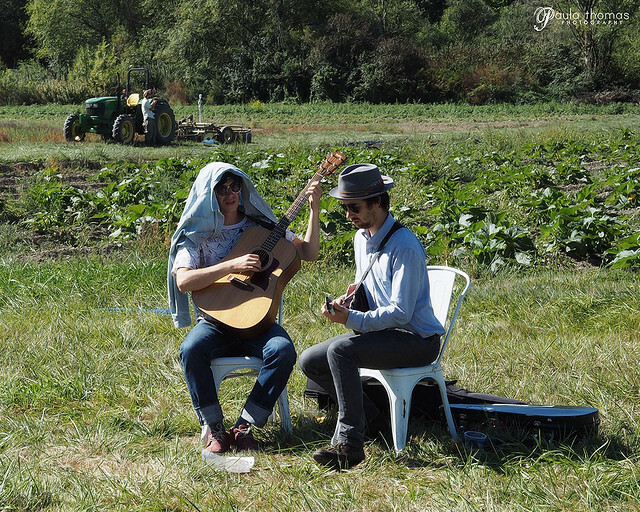 They however did not seem to be interested in harvesting any of their weeds. I admit I have some of these weeds in my yard too and don't eat them either but my chickens love amaranth. I should see if they will eat the lambs quarters too. 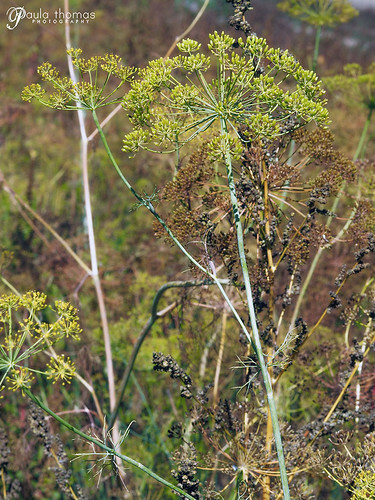 On our trek through the fields, we passed some overgrown area that he said they let flower and go to seed to encourage the beneficial insects and pollinators because they love the flowers from brassicas and dill weed. They had a lot of carrots growing in the first field we crossed but I think there were more weeds than carrots. The carrots didn't seem to mind the weeds though. We got to harvest a few while as we crossed the field. I always wait too long to harvest my carrots and they end up not being as good. I'm going to try growing some carrots this winter for the first time and hopefully not wait too long to harvest them. They can handle the colder weather if planted early enough. I just got them in the ground earlier today, hope I got them planted in time. Every farm has it's failures and we got to see one of their biggest failures this year. They had a huge cucumber beetle infestation that spread mosaic disease that pretty much wiped out their Marketmore cucumbers. Luckily, they had another variety that didn't get hit as hard and were able to harvest more of the cucumbers from that variety for their pickles. They won't have as much as they would have liked but it's something. I grew marketmore cucumbers in the greenhouse this year and they were not very productive but I think it was more due to not enough water. Oxbow, as do I, practice crop rotation to help with disease and pest management. Planting the same crops in the same place every year depletes the soil of the nutrients needed to grow that crop as well as increases your risk of getting diseases and pests but sometimes there's nothing you can do but try again next year. 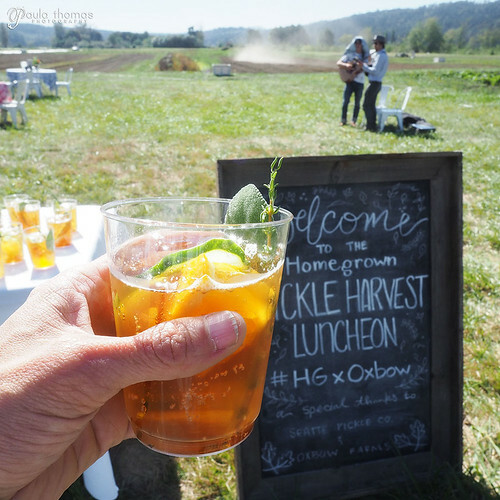 Oxbow is an organic farm so they do not use any chemicals on their land, nor do I. 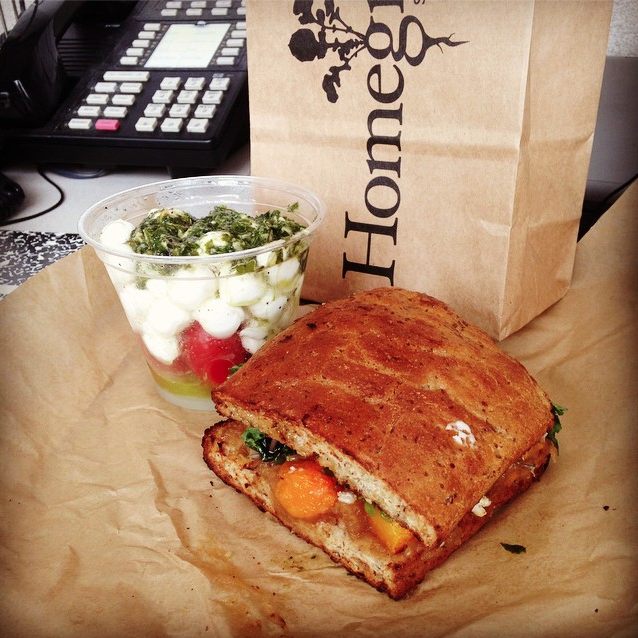 If you've never been to Homegrown for their great salads and sandwiches, check them out. 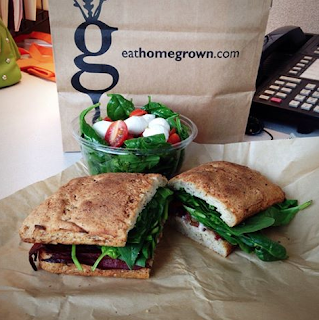 They now have locations all over the greater Seattle area, including Redmond, Bellevue, Capitol Hill, Downtown Seattle, Fremont, Kirkland, Mercer Island, Queen Anne, Sammamish Plateau and South Lake Union. They also have a gluten free bread option which comes from Nuflours on Capitol Hill.